The Weald’s iron deposits lie relatively close to the ground surface, and so were easily extracted by open cast mining. Most extraction and smelting took place in the High Weald, a section stretching roughly east of Horsham across to south of Tunbridge Wells, and down to Hastings. High yields were obtained within this geological triangle: beneath the Wadhurst Clay in the Hastings Beds, and in parts of the Weald Clay and Tunbridge Wells Sand. The great forests of Worth, St Leonard’s and Ashdown had early been important smelting districts, systematically managed by multi-stemmed coppicing to conserve timber for charcoal production. The earliest, rudimentary, form of iron smelting used a 'bloomery'. Here, a small conical furnace, located close to an iron ore source, was built of clay, in which iron was smelted with burning charcoal. The temperature was boosted by bellows, pumped into the furnace base. Gases escaped through an outlet in the roof, and waste material ran down and away, leaving the iron reduced to a malleable lump. This iron lump, or ‘bloom’, contained a high degree of cinder which was then either purified by hammering into a solid bar or forged immediately into tools or weapons. Bloomeries were often sited near streams, where high banks exposed geological seams, allowing the easy identification of ore. Streams provided water to cool the iron and forge tools, but water power was not yet used for any part of the process. However cast iron was brittle, and needed remelting and hammering at a finery forge to convert it into highly durable ‘wrought’ iron. Forges now also used waterwheels to power bellows, to re-melt the sows at a high temperature, but their main function was turning huge mechanical hammers to pound the result into short thick iron bars, called anconies. The hammer was attached to a shaft on the waterwheel and could pound the iron up to 60 blows per minute, so forge production was also increased. The Rural Life Centre has kindly produced a video showing their half-scale model of waterwheel-driven furnace bellows and hammer in operation, which can be seen at: http://www.youtube.com/watch?v=EQVgTi__y40 . Incidentally, an experimental smelt was held in 2014 to attempt cast iron prodction which was surprisingly successful given the small scale of the furnace - volunteers are needed for futher experiments, see Museums for details..
Anconies were forged further in chafery hearths. This three-stage conversion process, pioneered in the Low Countries, was known as the Walloon system. Conversion forges were sited at some distance from the furnace, but usually along the same stream. The first British blast furnace, Queenstock, was built around 1490 in the Buxted area. In 1496 Henry VII sought state of the art weapons for his impending military campaign against Scotland. French ironworkers from the Pays de Bray in Normandy, an area renowned for its iron-smelting expertise, were invited here to cast ordnance using the Walloon system. This was nearly seventy years before the Midlands blast furnace industry, and so arguably the first British industrial revolution. Many skilled immigrants arrived from Bray and environs over the next fifty years or more, and much of the original French terminology endured, eg ‘chafery’, and ‘tuyere’ (ie the clay pipes for the bellows). Initial products included pig iron, iron shot, and mechanical parts for wooden gun carriages (C&C, 1995: 113). The new method enabled the relatively easy manufacture of large guns, and the first Wealden cannon were cast in two sections. Although cheaper than bronze cannon they were far less reliable. Sussex gun founding was perfected fifty years later when Parson William Levett, gunstone maker to the Crown, inherited his brother’s furnaces around Buxted, including Queenstock, and Maresfield. 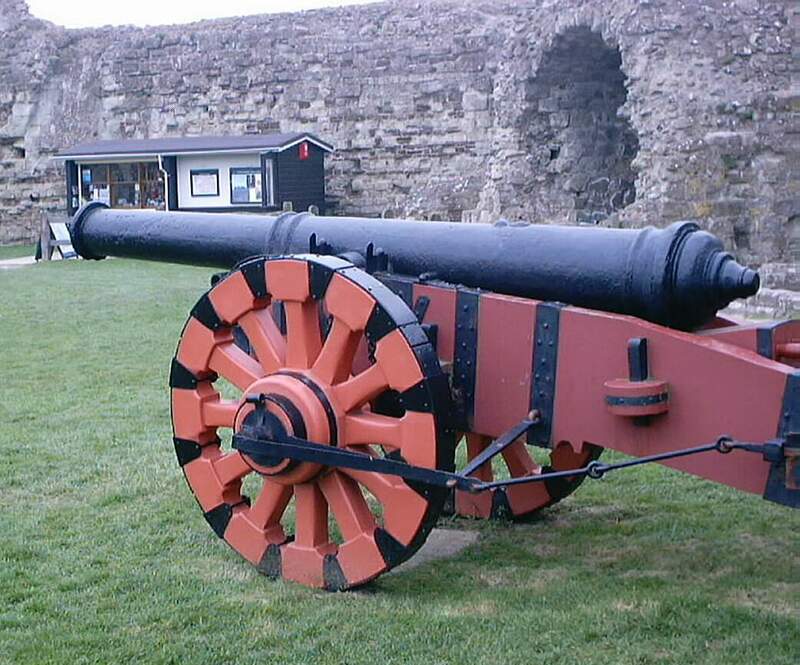 In 1543, he employed Frenchman Peter Baude, from the Houndsditch foundry in London, who was able to cast Sussex iron guns vertically in one piece thus increasing strength and reliability. The iron was poured around a model of the cannon bore, which was later smoothed by a cutting bar at a boring-mill, also driven by a waterwheel. Within a century of these innovations over a hundred blast furnaces and associated fineries were operating in the Weald. By the late sixteenth century, other parts of Britain with suitable ore deposits were building similar ironworks. Anne of Cleves House Museum in Lewes, East Sussex, has an extensive exhibition of the entire iron-making process, including estimates of the raw materials required. Guns for government ordnance or export were sent to Woolwich Arsenal to be proved by Crown inspectors. Sussex guns were renowned for their reliability and durability. Cheaper than bronze cannon, they were ideal for static positions at the proliferating southern coastal forts and defences. Britain’s increasing overseas trade, colonial endeavours and skirmishes also sustained this market. Rapid fortunes could be made from iron founding. Rich landowners and farmers soon established ironworks, on their own land or elsewhere as appropriate, hiring skilled ironworkers. Major iron families included the Challoners, Bowyers, Carylls, the Streatfeildes of Chiddingstone, the Fullers of Brightling and the Barhams of Wadhurst. Many skilled ironworkers prospered, and in turn invested in the industry themselves, renting land and waters. Although old ironworks lakes are usually referred to as hammer ponds, by now it should be obvious that a hammer pond served a forge, not a furnace. The two enterprises were usually related by owner and location, and the design for the water supply was virtually identical. A large clay dam, known as a ‘bay’, was built across a valley to impound the flow of an existing stream. Furnace or forge buildings were sited below this embankment, which raised the water level by as much as ten or fifteen feet to build up enough water pressure to drive an over-shot waterwheel. Sluice hatches regulated the water flow to the wheel, and through the spillway. As silt built up, both flow and storage capacity gradually diminished, and so ‘pen’ or feeder ponds were often constructed upstream as emergency reservoirs to top up the main pond. Many pen ponds survive where the main ponds have not. Water shortages threatened not only production but also the furnace stack: if the fire got too low the iron solidified inside the structure and the whole furnace had to be rebuilt. Furnace blasting therefore took place in winter when water supplies were plentiful. Forges also needed large quantities of water, but not continuously, so their ponds had time to refill overnight. Blast furnaces now obviously focused on producing larger iron products ie pig and bar iron for local smiths and London ironmongers, as well as eventual cannon manufacture. The weight of these items and the fragile road conditions usually necessitated shipping them to London via the nearest navigable rivers such as the Medway, Rother or Brede out to the sea ports. Peripheral output continued to include builders' sundries, ploughshares and other agricultural tools, domestic items including cooking utensils for open hearths. Perhaps most famous are the cast-iron Wealden firebacks and memorial 'grave' slabs, a lucrative sideline. 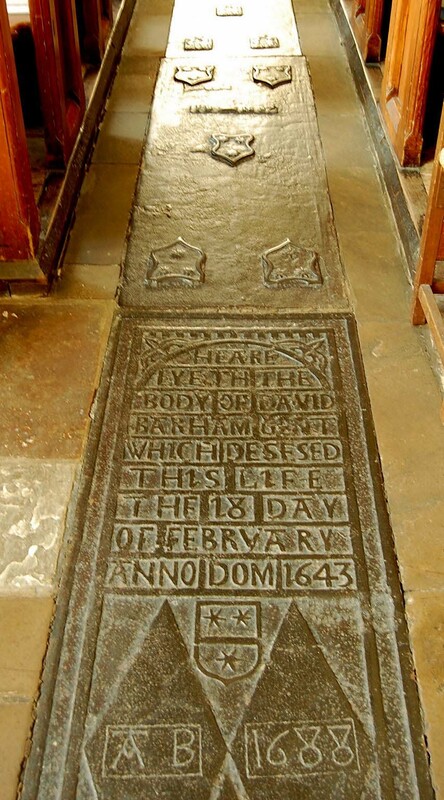 Many grave slabs, produced mainly for ironmasters’ family members, are set into the floors of local ‘iron village’ churches, eg at Chiddingstone, Mayfield, Salehurst, Sedlescombe, and West Hoathley. St Peter's and St Paul’s church at Wadhurst has the most extensive collection of over thirty grave slabs in the floor, many embossed with the family coat of arms. Grave slabs and firebacks were made by the same process. Molten iron was poured into a sand mould previously impressed with a design from a carved wooden board, or 'stamp'. Many can be found in old houses open to the public, such as Bateman’s and Michelham Priory, East Sussex and Lullingstone Castle, Kent. There is an impressive display of original firebacks at Anne of Cleves House Museum, among them the famous Lenard fireback of 1636, which depicts ironmaster Richard Lenard of Brede, his furnace stacks, various tools of his craft, and his dog. Another fireback commemorates Sussex Protestant martyrs. 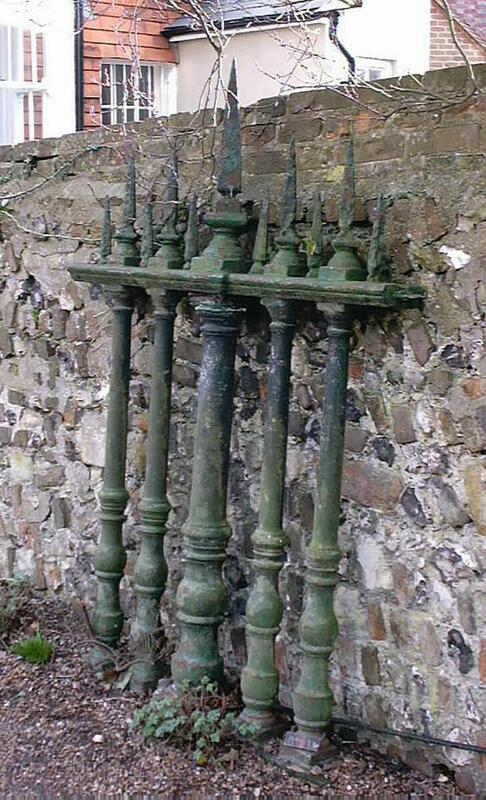 More Wealden iron artefacts can be seen at the Priest House in West Sussex, and various local museums. A Lenard Fireback: note the furnace stack in the lower left corner with gabled roof over the casting area. A wheelbarrow above is hurling a ball of charcoal from the loading ramp into the top of the furnace. One of the few surviving depictions of a working furnace structure. Wrought-iron balustrades and screens were manufactured for wealthier houses and churches, some of which are still in situ, such as the attractive iron screens across the chancel at Ashburnham church (TQ 695164). Gloucester Furnace at Lamberhurst in Kent cast the old gates and railings for St Paul’s Cathedral around 1710; this required 200 tons of iron and cost more than £11,000. 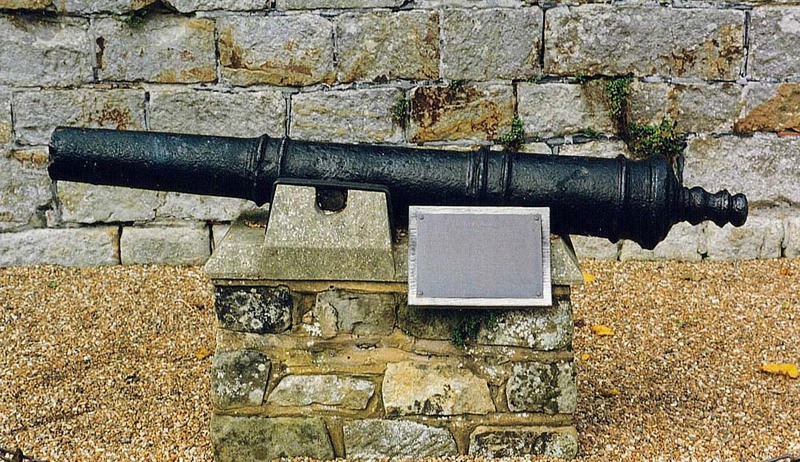 Some are still in place at St Paul's but most were removed: sections can be found on display in the gun garden at Lewes Castle, and on the pavement near the car park in Lamberhurst village. 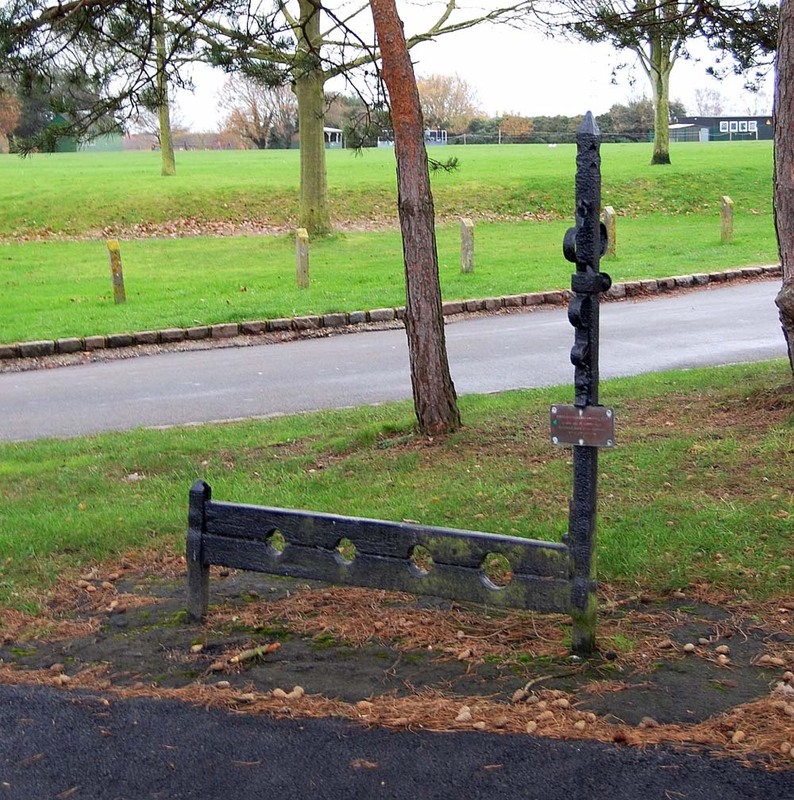 The stocks and whipping post by Ninfield Green (TQ 707124, above) were cast locally in the seventeenth century, probably at Ashburnham. During the English Civil War most ironworks supplied wholesale ironmongers with bar-iron and thereby distanced themselves somewhat from the consequences, but a few owners armed either side and became involved in the conflict. Royalist ironworks in St Leonard’s Forest were destroyed by Parliamentarian forces in the 1640s (C&C, 1995: 183). Furnaces were easily restored as long as the ponds were in good condition, but fluctuating ordnance demands ensured iron fortunes ebbed or flowed with peace or war. Over 14,000 Wealden guns were cast overall. Many survive at various artillery museums at Leeds, Woolwich, Fort Nelson, and other forts and castles including Tilbury, Portland Castle, the Tower of London and Pevensey Castle. 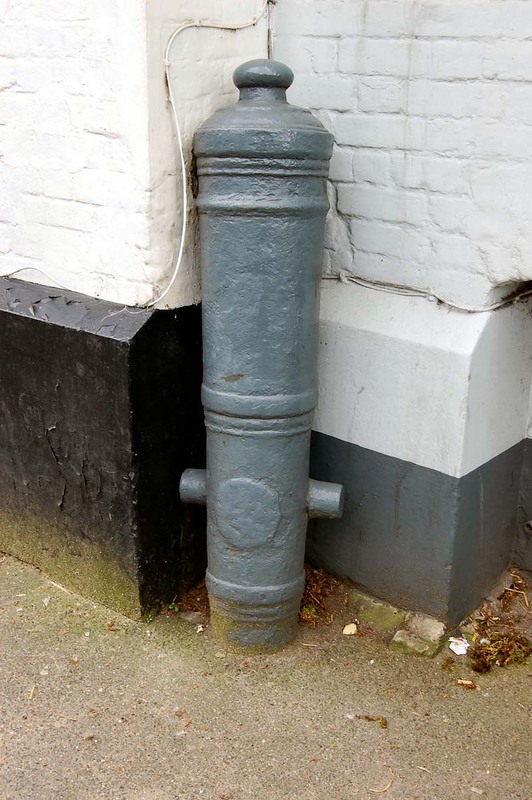 The Mayfield Cannon, on display in Mayfield High Street, was cast locally by Sir Thomas Gresham circa 1567-79. After 1650 cheap Swedish bar iron imports seriously undercut Wealden iron prices. Demands for fuel from other industries made charcoal increasingly expensive. Around 1709 Abraham Darby of Shropshire finally succeeded in using local coal, converted to coke, for smelting iron, and this cast iron was considerably cheaper. Remote from coal sources, and competing with cheaper pig and bar-iron imports from abroad, Wealden furnaces declined irretrievably over the eighteenth century and most of the area's ironworks closed by the end of the eighteenth century. Ashburnham Furnace in east Sussex was the last to cease production in 1813, bringing over three hundred years of the blast furnace industry to a close. Sadly, no Wealden furnace structures have survived due to historical reclamation for other buildings. There are no contemporary pictures apart from Swedenborg's cross-section of Lamberhurst’s Gloucester Furnace stack, above, published in 1734. Over 180 furnaces and associated forges operated within the Weald between the fifteenth and nineteenth century, each with its own pond, and usually a few pen ponds. Most of these are now dry. Many were converted to serve corn mills. Some were drained and the land reclaimed for agricultural use, other were swallowed up by reservoirs such as Ardingly, Darwell and Bewl. Tilgate Furnace Pond now lies beneath the suburb of Furnace Green, south of Crawley. Dozens of hammer and furnace ponds have survived, however, especially in the High Wealden area of Sussex between the North and South Downs. Usually hidden within wooded valleys, most are well worth visiting. They attract and support a variety of waterfowl, dragonflies and amphibians amongst the rushes and water lilies and several lie within designated nature reserves. Local place names, such as Hammer Stream, or Mine Pits Field are obvious clues to previous iron-workings in an area, and furnace or forge water features often survive in part. ‘Pond Bays’ of defunct old ironworks are often clearly marked as antiquities on Ordnance Survey maps of the Weald, like those near streams around Brightling and Dallington in East Sussex and Mayfield in Kent. The broken bay for Beech Furnace is thus marked down Wadhurst Lane, Battle (TQ 728167) near a pond which is not that of the old ironworks. Extensive details of all known iron-working sites and relics, such as mills, wheelpits, broken bays, spillways, weirs, and leats can be found in Cleere and Crossley's The Iron Industry of the Weald (1995). The remaining ponds cannot hint at the widespread heavy industry that dominated the scene a few centuries ago. The clamour of the hammers, the acrid smoke from the furnaces, the countless miners, fillers, finers, hammermen and carters, the roads blocked by oxen hauling iron and fuel, and riverboats laden with bar-iron would have presented a far busier and noisier landscape than today’s peaceful waters. Weed and silt have reduced some ponds in size while others have been altered for ornamental purposes. All have been reclaimed by flora and fauna, and many are now within Sites of Special Scientific Interest. Often assumed to be natural beauty spots in the High Weald (now an Area of Outstanding Natural Beauty) these delightful artificial lakes are useful reminders of the largely concealed post-industrial nature of so much of our countryside.